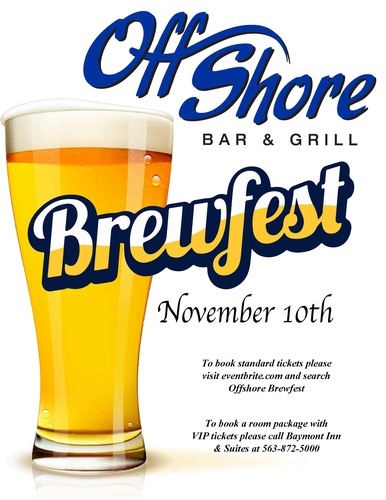 Come celebrate and sample craft brews from all over Iowa, Illinois, and Wisconsin at Jackson County's premier event venue, Offshore located in Bellevue, Iowa! Hotel room packages available which include either 2 or 4 VIP tickets with early entry and complimentary souvenir beer mugs. All reservations are prepaid and non-refundable. Also, enjoy food and live music Friday night and immediately after the event at Offshore Bar and Grill.